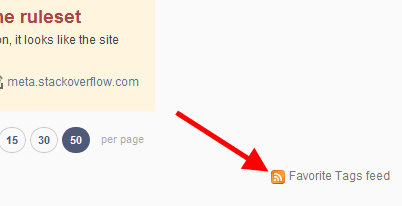 It would be nice if we could subscribe to an RSS feed of all the questions that match your 'favorite' tags i.e. an RSS feed of the questions that get highlighted as yellow when viewing the question list. You can achieve a similar effect by combining tags as described here and here, however this is a pain to maintain, requiring the RSS URL to be edited in the feed reader if you start monitoring new tags, or stop monitoring old tags, also you have to worry about getting the syntax correct (c%23 instead of c# as an example). Then you could change the tags that are included in that feed from the ‘prefs’ subsection of the user account area. Look for the default "Favorite Tags" filter. A solution has been implemented, but, since the cross-tag import process is for all of your Stack Exchance favorite tags, you can use my script to fetch the updated list of current favorite tags for specific Stack Exchange instances. The script lives on bitbucket. Feel free to contribute. I don't know why it is so hard to add an RSS feed based on tags. I couldn't seem to follow @Jeff's directions and it seemed like too much trouble to run a script. However, taking a clue from @mrucci's answer and doing some more experimenting, I found a way to get the RSS feeds that I want without too much trouble. Just enter addresses like these into your feed reader and you are good to go. After rereading the OP's question, I realized that my answer does not solve the question of getting all your current favorite tags with a single link. Sorry to the OP for that. However, the above method is as much as I needed and so I will leave my answer for others who come here with similar requirements. Not the answer you're looking for? Browse other questions tagged feature-request status-completed tags user-accounts rss . How do people find out about new questions? On StackOverflow, how to get newest questions for specific tags? What's wrong with RSS Feed? RSS feed of user's posts across the network?